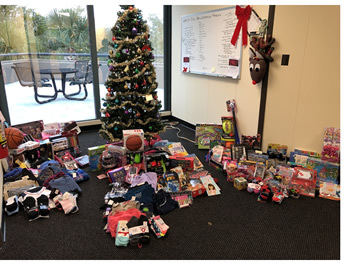 In December 2018 the Finance & Accounting (F&A) department continued its tradition of collecting gifts for the Boys & Girls Clubs of Central Florida with the added support of Procurement Services. Together, staff donated more than 200 presents with an estimated value of approximately $2,400. Donations included a variety of items including games and clothing. 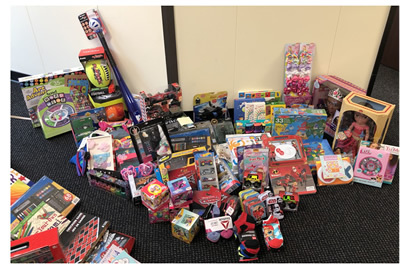 The annual gift drive began in 2005 when Varsha Das, currently an applications systems analyst programming manager in Financials Support Services (FSS), suggested that FSS share with the community instead of having an internal gift exchange. “The idea was enthusiastically supported by the FSS team, and the annual tradition of holiday giving started,” she said. Soon after, the rest of F&A joined the effort. Procurement Services added their support to the most recent drive and saw to it that donations exceeded expectations. The Boys & Girls Clubs of Central Florida was chosen to receive donations because of its commitment to supporting at-risk, local children. In addition to offering after-school programs that focus on fair play, honesty, and sportsmanship, club leaders take a personal interest in participants’ lives. Leaders encourage personal growth through sports and arts programs, provide counseling during difficult times, offer tutors, and assist students in applying for scholarships and applying to college or trade school. They also ensure that kids receive holiday gifts from donors. 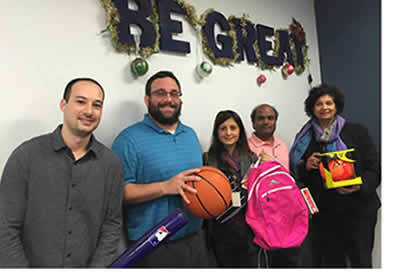 Das and Kiran Acharatlal, FSS web developer, have organized the gift drive each year, circulating a list of possible contributions in time for holiday shopping. They designed the campaign to be as inclusive as possible. For a few staff, participation has become a family tradition. FSS volunteers deliver the gifts to the central office of the local Boys & Girls Clubs. Each club director then chooses gifts for the specific children in their care. “We applaud the Boys & Girls Clubs of Central Florida’s efforts in trying to bring cheer to as many children as they can, and we are happy to be a part of that. There is nothing better than seeing the smile of a child that has received a gift on Christmas,” Robinson said. The first meeting of what would become the Boys & Girls Clubs of Central Florida met in 1944 in Orlando. Today, 31 clubs in five counties provide safe places to learn and grow for nearly 14,000 children between the ages of 6 and 18. To learn more about the organization or to get involved, visit their website at bgccf.org.